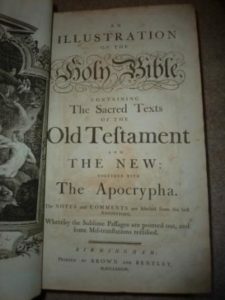 The Cheshire family bible is a large bible published by Brown and Bentley in Birmingham in 1789. 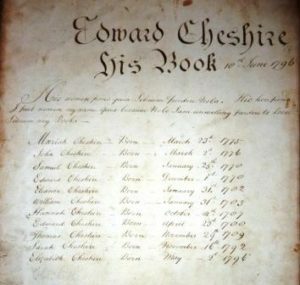 Its original owner was Edward Cheshire and he dates it as 10 June 1796. The bible has made its way to us from Edward Cheshire via his eldest son John Cheshire. We can presume it was in the hands of John’s wife Priscilla Cheshire (nee Onions) at her death in 1848. It then went to Priscilla’s daughter Sarah Hartill and then passed down through the eldest daughters to Hannah Pitt Showell and into the Downing family. Inserted in the bible is a sheet from C M Downing (Molly Evans) dated June 1969 stating that she presumed that it came from her father’s family.The full list of the descendants of Edward Cheshire now make it clear how this book came into our possession and was therefore misplaced with the Evans archives. The bible contains important inserts that are rewritten registers of the Cheshire and Onions families. These must have been written between 1840 and 1850 perhaps by Sarah Hartill – Edward Cheshire’s grand daughter. There are six items of family history interest. Lock of girls hair in the form of a clover leaf. High quality photos of all these are now available on request.